This is the week of the 40th annual Western Apicultural Society's conference, set Sept. 5-8 at the University of California, Davis. The non-profit group, founded at UC Davis to meet the educational needs of small-scale beekeepers primarily throughout the western United States, will meet in the Activities and Recreation Center (ARC) on campus. 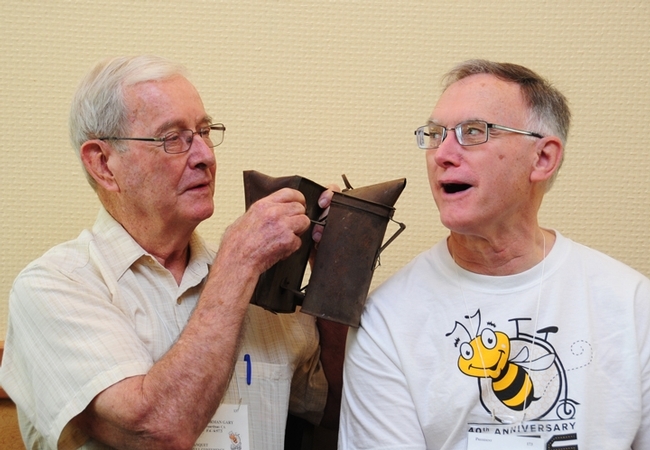 It's a conference filled with educational topics, networking, field trips, a silent auction, door prizes and just plain "bee" fun, says honey bee guru and Western Apicultural Society (WAS) co-founder Eric Mussen, Extension apiculturist emeritus, UC Davis Department of Entomology and Nematology, who is serving his sixth term as president. He's been bee-sy. Ditto the delivery services to the third floor of Briggs Hall. 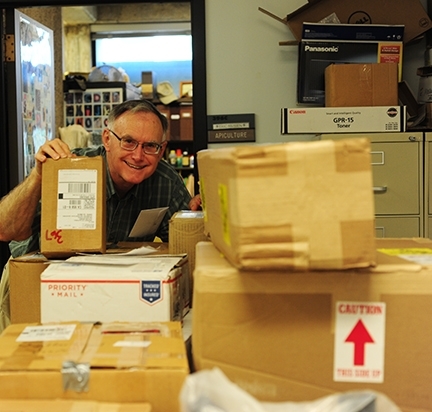 Tomorrow the packages will be trucked over to the ARC, and the anticipation continues. 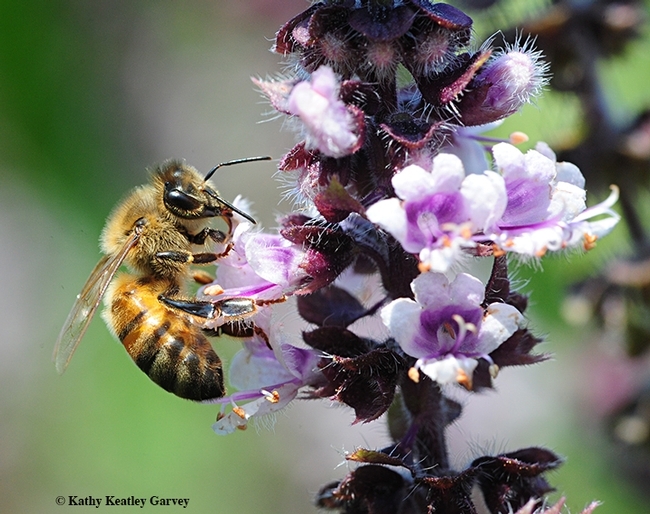 The newest addition to the conference schedule is the "Kids and Bees" program, set from 10:30 a.m. to noon on Tuesday, Sept. 5 in the Häagen-Dazs Honey Bee Haven, located on Bee Biology Road, UC Davis campus. The haven is the department's half-acre educational bee garden. "Bee Girl" Sarah Red-Laird of Ashland, Ore., program director of the American Beekeeping Federation's "Kids and Bees" Program and executive director of Bee Girl will be "borrowing" the site as part of a grant from the American Beekeeping Federation's Foundation for the Preservation of Honey Bees. 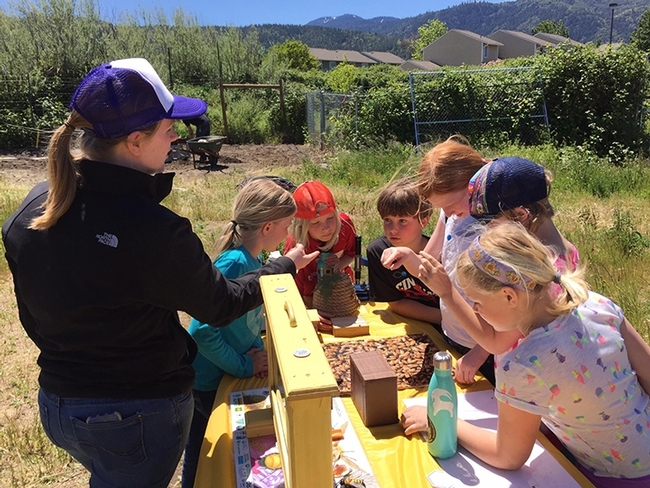 First-graders from Peregrine School, Davis, have signed up for the interactive educational program involving bees and beekeeping, honey, beeswax and bee habitat. 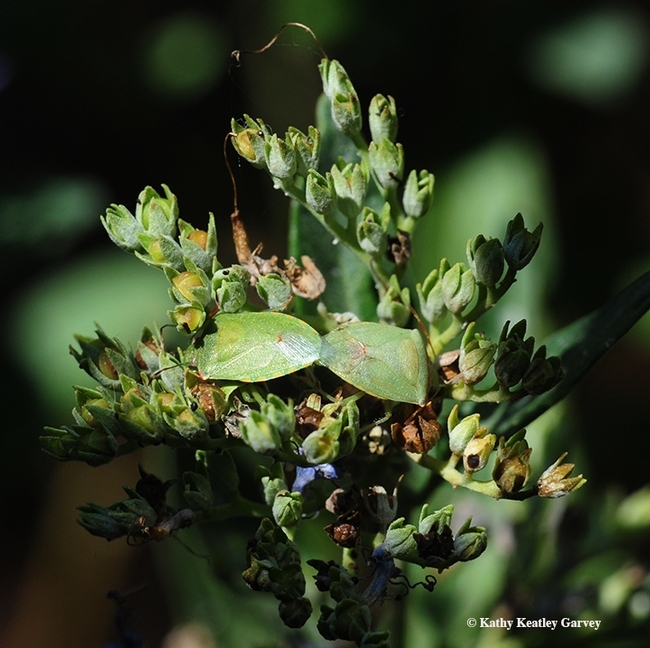 Said Sarah: “They will watch bees dance, listen to them buzz, taste honey, smell flowers, roll beeswax candles, observe pollination, take flower seeds home to plant, and learn about the important connections between themselves, bees and our food. The students are keenly interested in learning more about bees, in keeping with the school's motto of “SOAR” - Science, Outdoor Education, Arts, and Responsibility. Robbin Thorp, distinguished emeritus professor of entomology, and staff research associates Bernardo Niño and Charley Nye of the Harry H. Laidlaw Jr., Honey Bee Research Facility/UC Davis Department of Entomology and Nematology will staff four of the work stations. As for the Bee Girl organization, Sarah describes it as a "nonprofit with a mission to inspire and empower communities to conserve bees, their flowers, and our food system." 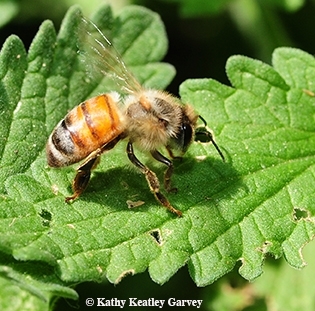 She serves as the Oregon director of the Western Apicultural Society, a member of the New York Bee Sanctuary Advisory Board, and the regional representative to the Southern Oregon Beekeepers' Association. She is also a "Mountainsmith Brand Ambeesador." (As of Monday afternoon, she was seeking several more volunteers. Those interested can contact her sarah@beegirl.org or 541-708-1127.) See her work on Facebook, Instagram and Twitter (@sarahBeeGirl). Her hashtag is #loveyourbees. Sarah says her love of bees began in Southern Oregon, on the deck of her aunt's cabin, at the end of a country road. She received her degree, with honors, in resource conservation from the University of Montana and did research in Jerry Bromenshenk Honey Bee Lab. She presented her beekeeping findings at the National Conference on Undergraduate Research on "How to Keep 100,000 Girlfriends, the Careful Relationship of a Beekeeper and Her Honey Bees." Following her graduation, Sarah returned home in late 2010 and found her niche, combining her love of bees with her education, outreach, research, conservation to form Bee Girl. She formed the non-profit experience to "encourage and support beekeepers and bee lovers." Sarah describes her Bee Girl organization as a "nonprofit with a mission to inspire and empower communities to conserve bees, their flowers, and our food system." 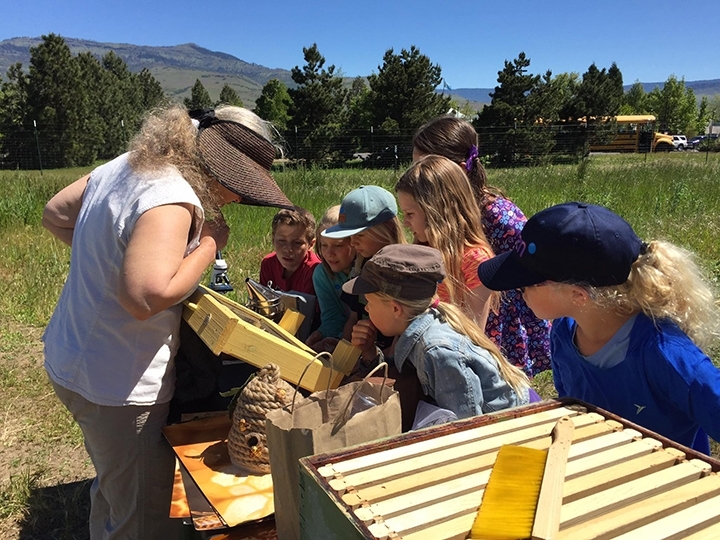 She serves as the Oregon director of the Western Apicultural Society, a member of the New York Bee Sanctuary Advisory Board, and the regional representative to the Southern Oregon Beekeepers' Association. She is also a "Mountainsmith Brand Ambeesador." (As of Monday afternoon, she was seeking several more adult volunteers to help out at the stations. Those interested can contact her sarah@beegirl.org or 541-708-1127.) 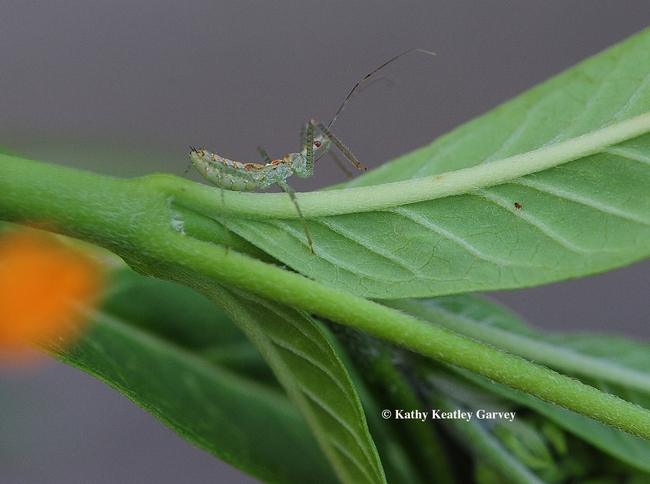 You can see her work--and her passion--on Facebook, Instagram and Twitter (@sarahBeeGirl). 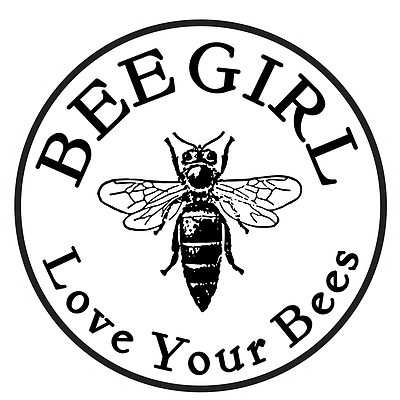 She's known by the hashtag, #loveyourbees. And she does. The logo adorns her bee suit. Topics at the WAS meeting? 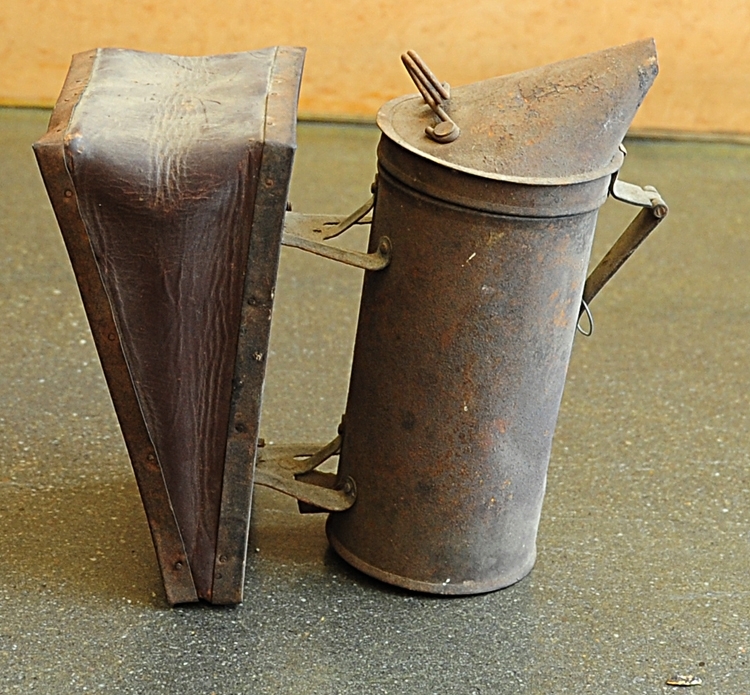 They range from Africanized honey bees to top bar hives to how to keep your bees healthy. See schedule. 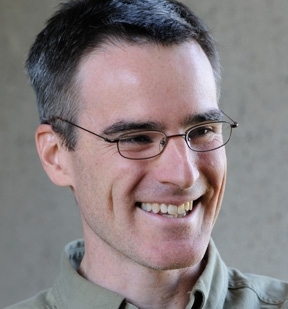 Eric Mussen, who offers 10 reasons why one should attend the conference (see Bug Squad blog), may be reached at ecmussen@ucdavis.edu for further information. How do you keep your bees alive and growing? That will be the topic of honey bee guru Lawrence "Larry" Connor of Kalamazoo, Mich., when he presents a special short course during the Western Apicultural Society (WAS) conference, to take place Sept. 5-8 in the Activities and Recreation Center (ARC), University of California, Davis. Connor will present the alternative short course, "Keeping Your Bees Alive and Growing," at 1 p.m., Wednesday, Sept. 6 for a $50 extra fee, announced WAS president Eric Mussun, Extension apiculturist emeritus. Said Connor: "We will start with the concepts in Two and a Half Hives: starting with two colonies of bees and making a nucleus the first season. 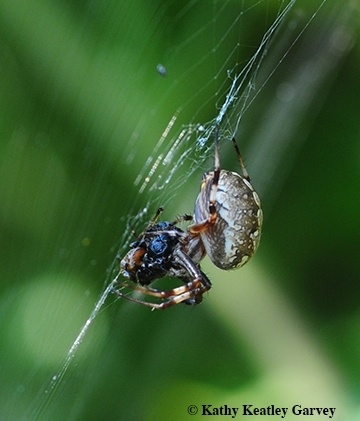 We will show you how to harvest the bees and brood for a nucleus colony. The same system will for anti-swarm management after your first season. We will spend time looking at nucleus management to cycle new, mite-tolerant queens into your beekeeping, including when and how to establish these hives and prepare them for the winter." He adds: "We will look at the general nature of bee population management—when to grow a hive and what to do when they fail to thrive. We will end with a discussion about establishing and maintaining a sustainable apiary—keeping your bees alive and thriving year to year. If we have time, we will work on your reading list in beekeeping." A native of Kalamazoo, Connor holds a doctorate in entomology from Michigan State University, and worked as an Extension entomologist in apiculture at The Ohio State University from 1972 to 1976 before accepting a position in Labelle, Fla., to run a new bee breeding program, Genetic Systems, Inc., the world's first mass production facility for the instrumental inseminated queen honey bees. Connor left Florida in 1980 and began writing books with Wicwas Press LLC, a company he helped found and now owns. 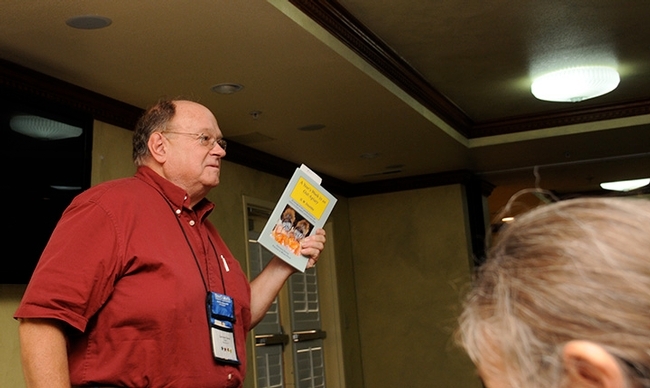 He has published more than a dozen titles dealing with bees, beekeeping, queen rearing and pollination. He regularly contributes to Bee Culture and the American Bee Journal magazines, addressing queen and drone biology and management and beekeeper interviews. He is also an accomplished photographer, artist and actor. Connor will be one of some 16 speakers, ranging from California to Canada, to address the WAS conference. WAS originated at UC Davis. More information on the conference is available from the WAS website or by contacting Eric Mussen at ecmussen@ucdavis.edu. WAS, open to all interested persons, is a non-profit educational organization, geared for small-scale beekeepers in the western United States. Excitement is building for 40th annual Western Apicultural Society (WAS) conference, set Sept. 5-8 at the University of California, Davis, its birthplace. The non-profit educational organization, geared for small-scale beekeepers in the western United States or those just interested in bees, is headed by president Eric Mussen, Extension apiculturist emeritus, of UC Davis. 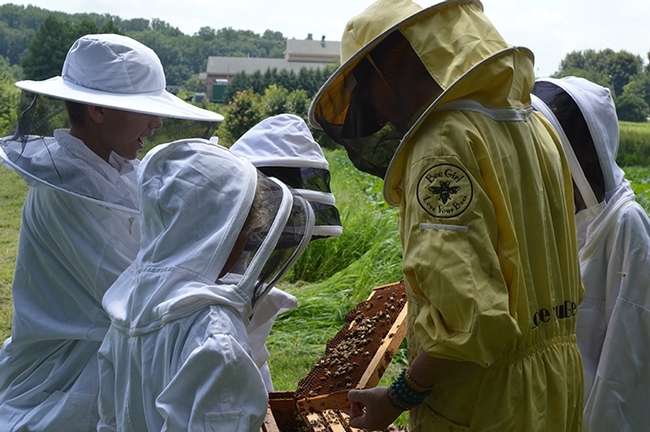 The conference takes place in the Activities and Recreation Center (ARC) and also will include tours to the Department of Entomology and Nematology's Harry H. Laidlaw Jr. Honey Bee Research Facility and its adjacent Häagen-Dazs Honey Bee Haven, as well as sojourns to Woodland to see the Mann Lake LTD facility (beekeeping supplies), and Z Specialty Food. "The speakers are from throughout the country and also from Canada," Mussen says. Among the speakers: Kim Flottum of Medina, Ohio, editor of Bee Culture; Les Crowder of Austin, Texas, author of Top-Bar Beekeeping; Gene Brandi of Los Banos, president of the American Beekeeping Federation; Larry Connor of Kalamazoo, Mich., author and beekeeper; Rod Scarlett, executive director, Canadian Honey Council, and Slava Strogolov, chief executive officer of Strong Microbials Inc., Milwaukee. 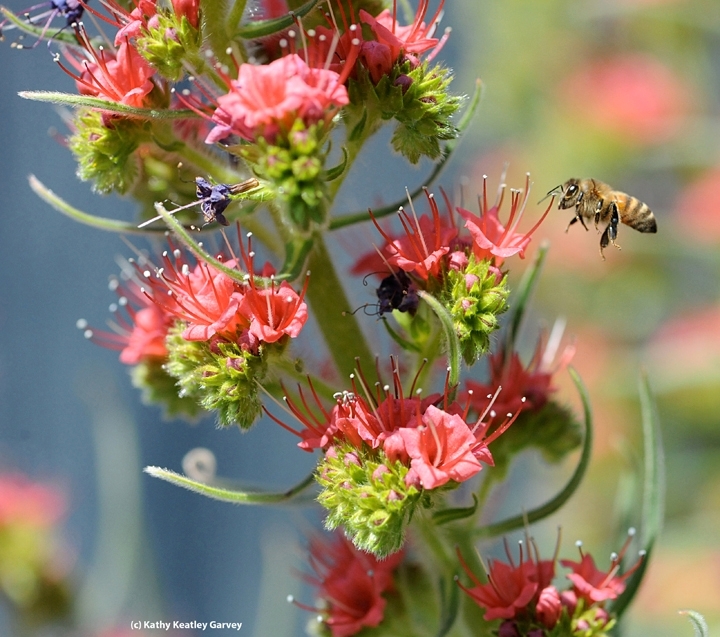 UC Davis will be well represented, Mussen points out, noting that "we have widespread and varied expertise covering everything from honey bees and native bees to honey tasting and bee gardening." Associate professor Brian Johnson will speak on “Geographical Distribution of Africanized Bees in California” 9 a.m., He will show “the results of a genotyping study of bees caught from across California showing the current distribution of Africanized Honey Bees in our state." It's good to see native bees sharing space with honey bees at the conference and to see Neal Williams and Robbin Thorp in the line-up. Williams, promoted to full professor this year, will discuss his applied research, which, he explains, "addresses the integration of wild and managed bees for pollination of diverse agricultural crops including seed production, row crops and orchards." Williams adds: "This research addresses as series inter-related questions. Under what contexts, in terms of local management and landscape context, can native pollinators provide sufficient pollination for different crops? 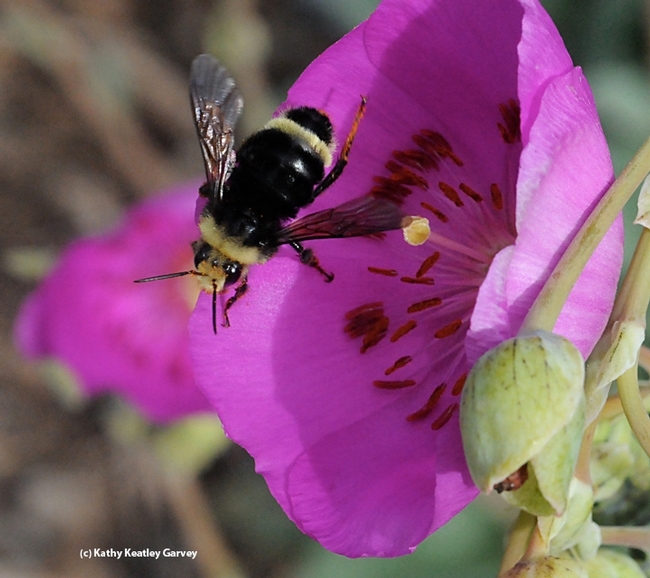 How can we enhance habitat and diversify agricultural systems to promote managed and wild bees? 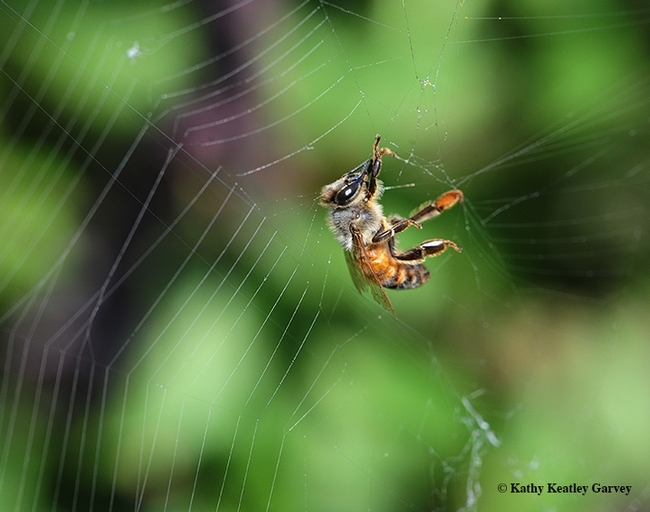 Do pollinators like honey bees and wild bees interact in ways to increase the overall effectiveness of crop pollination? 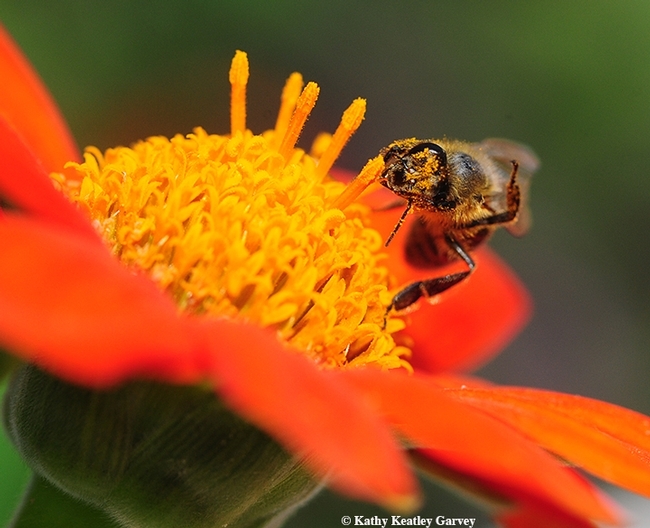 The answers to these questions helps alleviate the stress placed on honey bees and also informs ways to more sustainably manage agricultural systems to promote biodiversity and production." Robbin Thorp, an international expert on bumble bees and other native bees, retired from UC Davis in 1994 after 30 years of teaching entomology and pollination biology courses and conducting research on bees as pollinators of crop plants. "The primary focus was on honey bees in almond, but I also studied native bees as pollinators of various crops and in natural ecosystems such as vernal pools," he says. 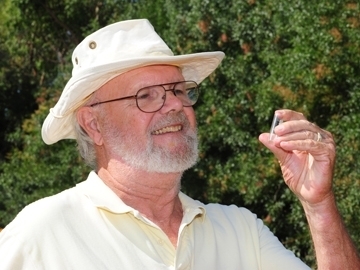 Since retirement, he continues to conduct research, primarily on native bees and to do outreach education on bees. 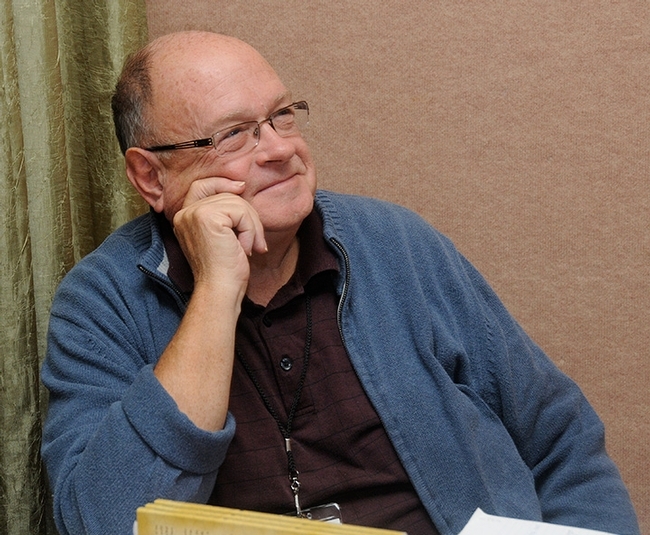 He is currently teaching at The Bee Course, a 10-day workshop sponsored by the American Museum of Natural History and held every year in the Southwestern Research Station, Portal, Ariz. One of the longtime faculty, he has annually taught at the Bee Course since 2002. The WAS conference also will feature a trip on Thursday afternoon, Sept. 7 to the UC Davis bee biology facility, appropriately located on Bee Biology Road. That's when several UC Davis faculty or staff, along with beekeeper/scientist Randy Oliver of Grass Valley, will staff a total of five education stations from 1 to 4 p.m. at either the Harry H. Laidlaw Jr. Honey Bee Research Facility or the bee garden. Staff research associate Bernardo Niño will discuss various beehive iterations; Randy Oliver will cover how to determine various levels of nosema and varroa infestations; Brian Johnson will explain how to prepare honey bees for the molecular study of Africanized honey bees; and Christine Casey, staff manager of the department's half-acre Häagen-Dazs Honey Bee Haven, will discuss what to plant in a bee garden and how to maintain it. In addition, Casey will lead a tour of the haven at 9:30 a.m. on Wednesday, Sept. 6. “The haven is a unique outdoor museum designed to educate visitors about bees and the plants that support them," Casey says. 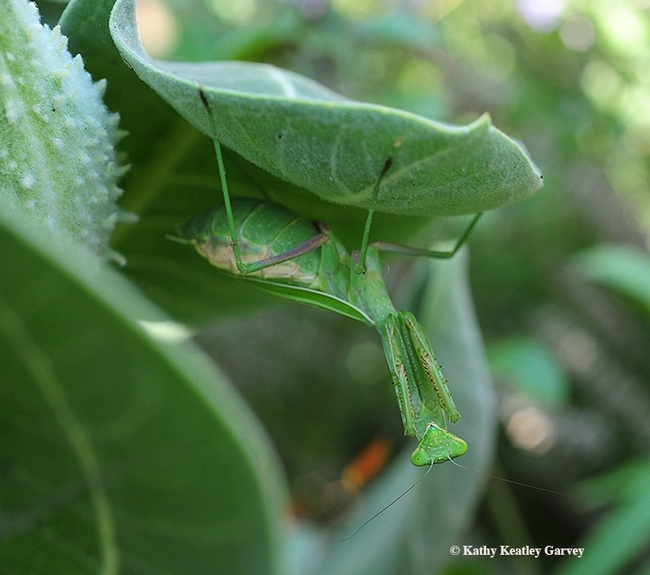 "Tour participants will see some of our 85 bee and 200 plant species, learn about our outreach and research programs, and gain ideas for their own bee gardens." Honey Tasting: Amina Harris, director of the Honey and Pollination Center at the Robert Mondavi Institute of Wine and Food Science, UC Davis, will lead a moderated honey tasting at 11 a.m. on Wednesday, Sept. 6. The event is titled “Taste the Honey Flavors of the West: How Understanding the Nuances of your Honey Can Help You Market your Perfect Sweet.” Said Harris: "Basically, I plan to discuss the diversity and life styles of non-Apis bees to show how different most are from honey bees." 40-Year-Old Memories: The founders of WAS will reminisce on "how it all began" from 8:45 to 9:30 a.m. on Wednesday, Sept. 6. 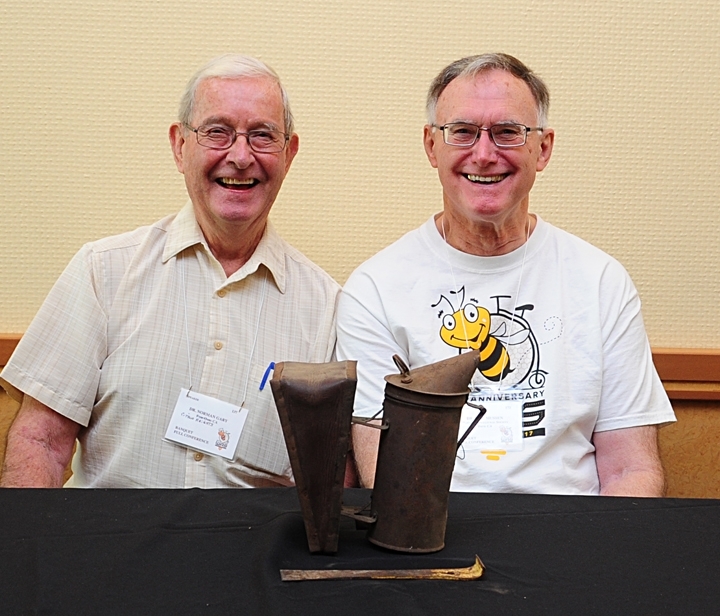 The organization, founded at UC Davis, was the brainchild of Norm Gary, then professor of apiculture (now emeritus), who served as the founding WAS president. Assisting him were Eric Mussen, then an Extension apiculturist, who accepted the office of vice president; and postdoctoral fellow Becky Westerdahl, now the Extension nematologist in the department, elected secretary-treasurer.